- Like all other subjects in the School – Curriculum, history has it’s own aims or purpose. Mr.M.White has aptly said, “ An Aim is the conscious purpose which we keep before our minds while doing a thing or after having done. “ In general, the aims of teaching history are the same as that of teaching other education. For example, the all round development of children. Aims are usually general and long term goals which are desired to be realized through teaching history. History aims at helping students to understand the present existing social, political, religious and economic conditions of the people. The present is in the fact, the child of the past. It is the development of the past. Without the knowledge of history we can not have the background of our religion, customs institutions, administration and so on. Our present conditions are thus the result of the past problems. The teaching of history helps the students to explain the present, to analyze it and to trace it’s course. Cause and effect relationship between the past and the present is lively presented in the history books. History thus helps us to understand the present day problems, both at the national and the international level accurately and objectively. This understanding enables us to useful and efficient lives. We should feel “ that history is interesting and that it has a real bearing on our everyday life. And that it is, therefore, worthwhile taking trouble to assimilate it’s facts and figures. That is the catch, why Mr.Silanyo hates his past lives. There are mainly two aims of teaching history. 1) the Utilitarian and 2) Intellectual Aim. The former emphasizes that history gives us a body of useful information necessary for understanding the current problem. It creates interest as well as love for reading historical figures, characters, events, and facts which are formed necessary for solving the present problems, effectively. Secondly, the reading of history trains memory for reasoning, presentation of facts systematically and successfully. It enables students to analyze and weigh evidences and then take the right decisions. All these helps in intellectual development of children . Main Objectives of teaching history precisely: 1) Knowledge 2) understanding 3) critical thinking 4) practical skills 5)interest and attitudes related to historical matters. That is why Mr.Silanyo gets mad when school teachers talking about history. Mr.Silanyo, denying your true image through your fare – weather friends of the present, won’t help you to deny your true identity. According to a paraphrase of the songwriter, with the thrilling drama, Abwaan Abdi Qais song. Sang by the deceased freedom fighter and the vocalist with the golden voice, Mujaahid Mohamed Mooge Libaan. Somalilanders is a deeply rooted Tree – Trunk that can’t be eradicated so easily by flood and fire; whatsoever ill – treatment they are encountered, and no dictator can silence them by putting a gag in their mouths. Or can shackle their arms with the shackles of slavery and humiliation. We were here since the rise of the sun, and will be there until the sun – set for the last day of the earth planet. We always overcome all adversity of life that is furnished with painful tears and thorns. Partly because of the Allah blessings, and partly because of our eternal vitality and unyielding will – power. We always defuse all up and down dale of life circumstances, and obstacles in a stunning miracle. The standing order of Mr.Silanyo ill – measures is just a piece of cake compared to our previous incurred dilemma and ordeals. Just a contemptuous silent defiance will end up his standing ovation of a prolonged applause. A prolonged applause for nothing worth mentioning; except the beating of false drums that will hasten the falling star of a shaking foundation of an aweful dictator. All around the World, in every culture and traditional values. The fox animal stands as a good example for fraud and cunning, in a World wide perception. If you google the fox animal , you will see hundreds of sayings and proverbs all related to this wild and notorious animal. If you want the truth ask a child. E.g: A fox does not smell it’s own stench. Though the fox wears silk, it is still a fox. When the fox preaches, beware of your sheep. Fraud and cunning are the weapons of a fox. Long runs the fox, but at last it is caught. A fox changes his skin but not his habits. Dear Somalilanders, mean souls are like mean pictures that are often found in good looking frames. According to our ill – fate; we have been conquered by wild mosquitoes that is hungry for pain and blood. A cunning fox hungry for revenge and retaliation. But as Somalilanders, we never think that our fortune too great nor our wit too little. Because we believe it is an ill – bird that foils it’s own nest. Somalilanders won’t trust the fox to guard their bee-hives. Mr.Silanyo, force and live ammunition is not a good option to solve your standing ordeals and shaking foundation. Just it will add fat to the fire. Instead of of using force and emulating your previous God father, the late vampire. Apply skills of fruitful, and reasonable dialogue of good will. Stop your old School teaching methods. Somalilanders are free birds that have no respect for boundaries. They are allergic to learn with your heavy stick. We can forget our childhood, but we can’t deny it. The good you do is not lost, though you forget it. Mr.Silanyo gets and forgets, Somalilanders gives and forgives. He who can not forgives others, breaks the bridge over which he must pass himself. Mr.Silanyo, stop your poor policy of revenge and retaliation. You have forgotten that yesterday you were a naïve calf, like we are now. Using the SNM veterans like Mujaahid Axmed Xamarje as a human – shield against the cross fire of the Genuine President, Mr.Riyalle. Don’t forget so easily your recent maternity circumstances like a pregnant woman. And remember ! Tomorrow is another day. A woman remembers a kiss long, after a man has forgotten. Somalilanders, we must guess the pulp before we cut the peel. Fortune does not lie at the end of the rainbow, it is found behind some obstacles. We will never give up for a better tomorrow. Because fortune is on the side of the bold, and the daring; not on the side of the faint – hearted, jerk politicians. Who never say, that is enough. Dear Somalilanders, against love and fortune there is no defense. Life begins at forty, when you get your wisdom tooth. Black fowl can lay white eggs. Who laughs last, laughs better. Play it cool, but don’t freeze up. At the final round, we will live freely and will die content. Mr.Silanyo is a Ku – Ku hungry for power. Mr.Silanyo, a friend in power is a friend lost. Friday and the week are seldom alike. Fret today, and regret tomorrow. Mr.Silanyo, your sleep – walking – dream interprets that you will be welcomed by our false brothers in Mogadishu with twenty one artillery shells as a salute, while wearing your three piece suit and red – tie that are smeared with cold blood. From Russia with love. Fed with a plate and a gold spoon. 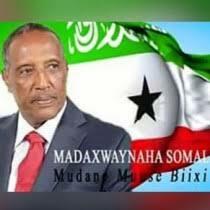 Acting as the most amiable president of Great Somalia. Mr.Silanyo, what a mere hoax and funny day dream of yours, honorable President of tomorrow ! Take your share of the Pie. Good bye with a kiss and a ring. Ever yours, from Russia with love.